Classic Industries offers a wide selection of Trunk Weatherstrip for your Chevrolet Chevy II Nova. Classic Industries offers Chevrolet Chevy II Nova Liftgate & Tailgate Weatherstrip, Chevrolet Chevy II Nova Rear Hatch Weatherstrip and Chevrolet Chevy II Nova Trunk Weatherstrip. 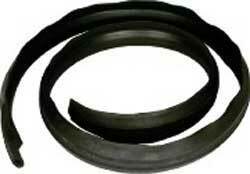 Correct replacement tail gate top seal for 1962-65 Nova station wagon models. Attaches at the top of the tail gate at the end where the glass comes out of the tail gate. Reproduction tailgate glass end seals for 1966-67 Nova wagon models. These seals fit into the vertical track in the tailgate to seal the gap between the inner and outer felts. Correct rivets are included.